I was beginning to think the annual cold that hits me in February might miss me this year, but it arrived unannounced yesterday morning. Gr. As I have been drinking gallons of various instant Thai soups and toddies to rid my nasal cavaties of this beast before Saturday's Birds and Beers, I wondered what might make me feel better. Reading some Isak Denisen? Watching old Douglas Sirk movies? But I decided to go back to Panama. This trip really stuck with me. I love travel and I'm generally happy where ever I am from a lone prairie in North Dakota to the porch step of my neighbor Zoe to an abandon research station in Kazaskhstan, but when I have quiet moments to myself, I find my brain returns to the platform on top of the Canopy Tower, gazing beyond the Panama Canal and into the unknown of the rain forest listening to unknown creatures in air thick with humidity carrying the smell of lush green leaves. One place that I really enjoyed was our trip to Municipal Summit Nature Park. 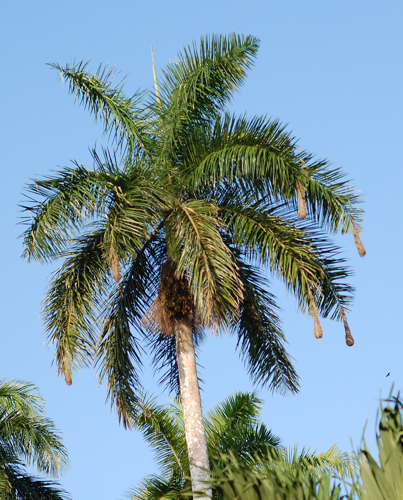 Check out those big hanging oropendola nests hanging from the fronds of a palm tree. This was a zoo and park and our primary reason for visiting was to see a harpy eagle exhibit. But what I really enjoyed about this park was that it gave me a chance to spend time with some common Central American birds--they weren't in cages but in the surrounding trees and gardens. Since so many people pass through the park, the wild birds are habituated to people and you could get some great views and photos. 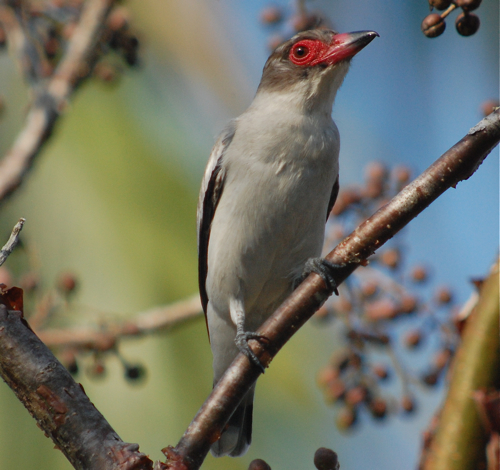 This is a female masked tityra, a cavity nesting bird. She was taking her time selecting the berries ready to eaten. I think this is one of those birds that scientists aren't sure where they fit in the grand scheme of taxonomy. That face with the red skin kind of reminds me of a crane or muscovy. I think I mentioned earlier that vultures were the most common bird in Panama--like house sparrows. 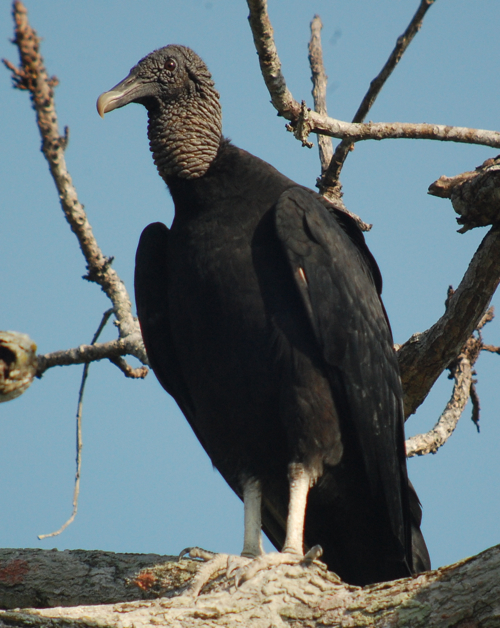 At the park, the vultures (like the above black vulture) flew in to see what pickin's could be had around trash bins and picnic tables. I believe you could throw scraps to some of these birds and they'd waddle right up. They were a bit cagey when I would aim my scope at them, pictures made them shy. It's okay to come to humans with food, not one that is giving you the stare down with a large scope. We did see the harpy eagle exhibit. I believe this bird is from the Peregrine Fund and has been part of the education and captive breeding program. Some harpy eagles have been released in Panama, not too far from Canopy Tower. I was a tad jealous to discover that one was seen on a field trip after I left the Panama, but sometimes in birding, that's the way it crumbles, cookie-wise. Look at the feet on this bird. This bird has what I would call man hands for feet--that's because they eat big prey...like sloth. There's a famous video of a harpy eagle grabbing and killing a slot. The first time I showed it to Non Birding Bill, he was underwhelmed. He said, "Yeah, it's big but come on, it's a sloth. It doesn't move that fast." But then he saw one being treated at The Raptor Center one day and was shocked by the size of it's toes--they were as big as his hands. 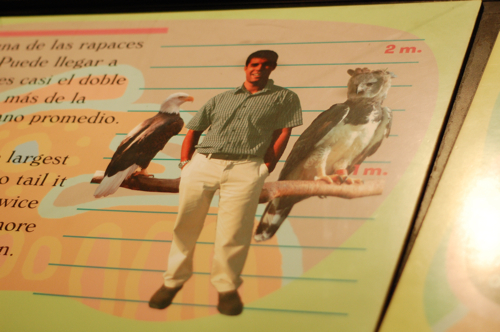 Here's a sign that gives you an idea of the size of the harpy eagle compared to your average guy and a bald eagle. 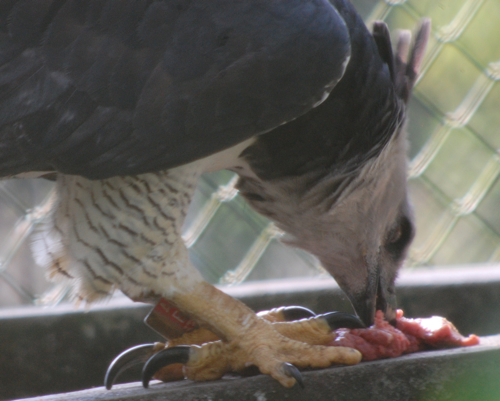 According to The Peregrine Fund a harpy eagle can be between 35 - 41 inches long (huh, I'm 60 inches long) and weigh anywhere from 10 pounds (a male) to upwards of 20 pounds (female). Bald eagles in MN average about 10 pounds. It's a big, cool bird and I was honored to see one in a large paddock if I could not see it in the wild. Isn't just the cutest little thing! These little dudes make bite marks along the palm leaf causing it to bend down and create a tent to roost under during the day (hence the name). This species of bat is very tiny and they eat a variety of foods including insects, fruit and nectar. I love that little stripey face. As we were leaving the park, we got one more bird--a black hawk perched on one of the paddocks. At first I thought maybe it was part of the zoo, but I banged on the cab of the truck to stop. It was a wild hawk that stay perched then flew across the road in front of us. I wasn't able to get a better photo, but it was a great view for my first ever sighting of a black hawk. That's gotta be like an itch you can't scratch. Alright, cold medicine is kicking in. Time to stop blogging.